It’s best to use paid advertising in short, intense bursts. This can get your app listed in “top selling” charts and then use the exposure for momentum. Plan your press release and paid advertising dates carefully. People tend to look for new apps after they’ve got a new phone, e.g. after Christmas, on payday, at the beginning of a college semester or on Black Friday. Always include a clear and direct call to action (e.g. “Download the new FREE Android/iPhone (as appropriate) time tracking app that will simplify your life”). Factor in the time of day – people won’t download fun apps during work or school hours. Don’t forget to use advertising on sites where your intended users might go to find out about apps, i.e. for games users may go to review sites such as PocketFullOfApps.com to find out about new games so will be more receptive to adverts. Be prepared to ignore everything you’ve read. It’s all about finding what works best for your app. Unsurprisingly, Google and Apple have their own paid app promotion and monetisation plaforms. Google’s in-app banner platform is called AdMob but can be accessed via their AdWords platform. 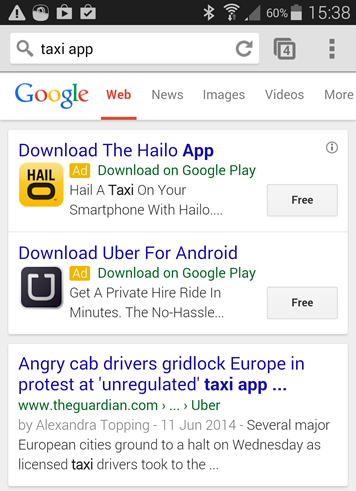 Google’s Display Network allows ads to appear in other apps and on websites. Users can be targeted based on age, gender, interests, types of apps installed, how new the device is and even whether or not they’ve visited your website. For example, our timetracking app adverts could be targeted at users who have calendar apps installed. YouTube adverts for apps now link directly to the Play or iTunes store. Facebook and Twitter are sites people go to on their mobile devices when they’re looking for entertainment… so it’s unsurprising that there’s anecdotal evidence that they’re effective for promoting games and certain types of apps. Each platform allows adverts to be targeted just to mobile devices and has a variable charging model for “app engagement” (clicks of your adverts) vs “app installs” (actual installation). Twitter app adverts allow a mobile app install button and screenshot. Ads can be targeted at followers of certain accounts, lookalike audiences or custom lists. One tactic we’ve heard used is to target ads at hastags used by similar apps or the people reviewers are likely to follow – industry gurus, news sites and important sites related to your app. Facebook app ads targeting options include location, gender, age, device and interests for adverts that show up in the Facebook app users’ newsfeeds. They also offer in-app adverts with their own display network.